There has been a lot of discussion online about wearing black arm bands and making buttons to get the word out in our communities about how school libraries are getting slashed by budget cuts and students are the ones getting hurt. Marin Teacher Librarian Tom Kahn has the right idea: He has a school blog read by students, teachers, and parents. So, he wrote a short but effective post on "Do Educators Need a Tea Party?" 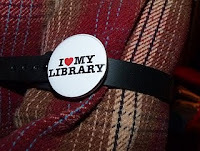 and included a close-up photo of an "I Love My Library" button tied around an arm of a suit jacket with a black arm band.